Catfish farmers have found success with split-pond designs. Such a design entails separating a smaller area, where the fish are kept, from a much larger area, where the water is treated. Split-pond farming has helped catfish farmers see their yields triple to 15,000 pounds per acre from 5,000 pounds per acre in the last several years, according to Silverstein. Frequently, farmed fish have to be fed fish oil near the end of their lives to help make them healthier for humans to eat. One of the ways to mitigate that dip in nutrition could be to turn to an alternative source of fish food: microbes. Researchers are currently trying to perfect the production of various microbes that could bulk up a farmed fish’s diet, thereby cutting the amount of food and agricultural land used indirectly by fish food production. Margareth Overland, a nutritionist with the Aquaculture Protein Center at the Norwegian University of Life Sciences, said one of the more promising microbial sources for fish food is yeast grown on processed spruce wood. Algae and bacteria are also being studied. However, microbe-based food is years away from being ready to supply large industries, and researchers still need to conduct taste tests to make sure there’s nothing especially fishy about a salmon that’s been dining on yeast. 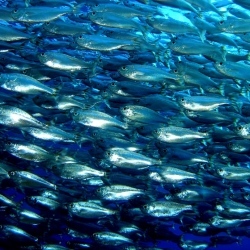 At the moment, “genetically improved” fish stocks make up just 10 percent of farmed fish in the U.S., Silverstein said. That figure could change soon. In December, the U.S. Food and Drug Administration released a preliminary finding that AquAdvantage salmon — a genetically modified Atlantic salmon that grows to full size much faster than normal fish thanks to the addition of genes from Chinook salmon and the ocean pout — would have “no significant impact” on the environment. That move signals that AquAdvantage salmon is nearing final approval. A single 3,300-metric ton next-generation salmon farm could produce enough fish each week to fill up an entire schoolbus, top to bottom, side to side, Summerfelt said — a rate that could satisfy 1 percent of U.S. salmon consumption.